Photo by Kiril Straxx from the Torontoist Flickr Pool. With teacher strikes threatening to disrupt the end of the school year in several Ontario districts, including Peel region, the hows and whys of education funding are under more scrutiny than ever. Last month’s provincial budget earmarked $25.2 billion for education—a considerable sum, second only to the $50 billion allocated to the health portfolio. That breaks out to $11,451 per student, or roughly the starting salary of a university arts graduate. So, how does the provincial government allocate these resources to ensure students and schools across Ontario get what they need? The name given to the $25 billion in education funding is the “Grant for Student Needs,” or GSN, which the province distributes to Ontario’s 72 school boards (31 English-language public, 29 English-language Catholic, four French-language public, and eight French-language Catholic), and a small number of schools run by 10 school authorities. The amount each board receives is based largely on student numbers, although the complex formula provides many exceptions for different factors, including schools that are isolated, small, or have large numbers of students with special needs or without English or French as a first language. For example, for every 1,000 primary students or Average Daily Enrolment (ADE), a board is entitled to 50.51 classroom teachers (presumably the .51 is rounded up as necessary to avoid frightening the younger kids), priced at a benchmark salary plus benefits. A similar formula exists for maintenance funding, with each elementary school pupil buying 104 square feet of space, larger secondary students 130 square feet, and adult education students only 100 square feet (the latter number lower because adult education doesn’t require special needs facilities). The school boards in turn determine how the the funding will be distributed among the schools in their jurisdiction, based again on number of students and other factors. They also establish criteria that allow schools to hire specialized staff such as teacher-librarians, and they decide how many administrative and maintenance staff are required for each school. At the bottom of the funding chain are the schools themselves, which make decisions within the budgets determined by the school boards. They allocate maintenance budgets, and decide teacher assignments and classroom sizes. The lion’s share of funding goes into the Pupil Foundation Grant, which in 2015-2016 will be around $10.45 billion, or almost half of the GSN. This grant funds the common elements used in educating students—teachers, guidance counsellors textbooks, classroom supplies, and the like. The amount of the grant per student is divided into three categories for elementary students—kindergarten, primary (grades 1 to 3), and junior/intermediate (grades 4 to 8). There is a single per-pupil amount for secondary students. This grant covers the costs of operating, maintaining, and repairing school facilities and amounts to $2.38 billion. The school operations allocation pays for things like heating, lighting, and cleaning, while the school renewal allocation goes towards repairs and renovations, adjusted for age of school and varying regional construction costs. Funding is also adjusted for unique architectural features such as wide hallways or large auditorium spaces. An interesting twist for this grant is that beginning this year, “a component of this funding that reflected the costs to clean, light, and heat school space that was underutilized is being phased out over the next three years.” While this probably doesn’t mean that underutilized halls and classrooms will devolve into cold, untended, rat-infested wastelands, it has an ominous ring to it nonetheless, suggesting that schools will no longer receive money to maintain unused space, and that some could be forced to close or consolidate. This grant provides allows extra funding for teachers, early childhood educators, and other classroom staff whose qualifications and experience earn them salaries and benefits higher than the benchmark calculation. This grant will add up to $1.75 billion in 2015-16. This grant pays for for principals, vice-principals, office support, and administrative supplies, and is projected to be $1.42 billion in 2015–16. This grant is unique in that it can be used by boards only for its designated purpose, while funding from other grants can be shifted around. The Special Education money is used for qualified staff, special facilities and equipment, testing, etc. Any funds not spent within the fiscal year must be saved and used for special needs in a future school year. This year the province has allocated $2.72 billion for Special Education. In spite of that significant sum, one of the criticisms levelled against the funding formula is that it doesn’t provide enough money, or at least apply it efficiently enough, to help special needs students. To this end, there are media reports about principals sending special needs children home because services are unavailable, and families moving to Alberta for more flexible autism services. All those school boards don’t come cheap, and in 2015-2016 this grant is expected to come in at $576 million. As per its name, the grant funds school board administration and governance, including everything from salary to offices and other facilities. Just what it sounds like, this grant provides school boards with funding to get the kids to and from school. It is projected to be $887.7 million in 2015–16. Other grants include the Learning Opportunities Grant (funding for students at risk of lower academic achievement) at $504 million, the Language Grant (provides for English and French language instruction) at $664.6 million, and the Safe and Accepting Schools Supplement, which provides $47 million to support secondary schools in priority urban neighbourhoods. 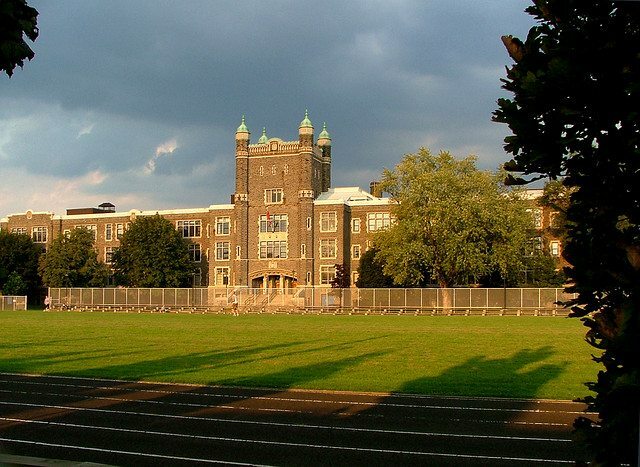 A recent report from the Canadian Centre for Policy Alternatives (CCPA) says that the funding formula shortchanges the education system, and Toronto in particular. The report seems to suggest that TDSB spending scandals are less important than inadequate provincial funding in explaining why GTA schools seem to be chronically short of cash. According to the CCPA, Toronto schools don’t get enough cash for even basic services like libraries, let alone services such as language training or programs for high-risk kids, which tend to be needed more in Toronto than in smaller municipalities. Still, if Toronto needs more investment in education (and we assume that waste-reduction programs will result in no significant savings), there are only a few places it can come from. Either the province shifts resources from other school boards, or from other programs into education funding, or gets increased funding for education from taxpayers. None of those options are likely to be well-received by the non-GTA population of Ontario, and the Liberal government, having snagged an improbable majority in the last election, will be keenly aware of that fact.